Welcome to my little attic studio! 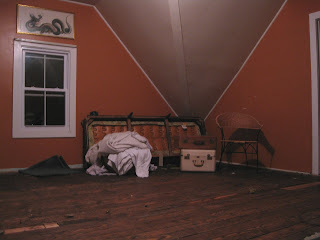 This is the burnt orange beginnings....this room was screaming for transformation! Don't ya think? Phase two...lasted almost as long as our winter did this year.....very very long... my little attic world didn't have any working heat yet, so progress was short at times...had to keep running up and down and warm my piggy toes. Thank you Mr. Fish for getting the heat up and running. A little paint and alot of STUFF and here's the final result. You may notice that I'm not really great at storing things neatly away or out of sight....I think it's an affliction that I have and I have had all my life(you should have seen my bedroom growing up, or maybe not)....gotta love Mr. Fish for putting up with my "grown up girl" clutter! There's nothing like starting a project and being able to leave it right in the same spot and have it stay there until you get back....ahhhhh no gremlins to move my stuff or take my tools. Finally having a space of my own to feed my head and spur my creativity is truly a god send. These are a few of the projects I have completed since I have had my own space. creativity! Thanks Karen for hosting such a fun event! I think I'm headed for inspiration overload! 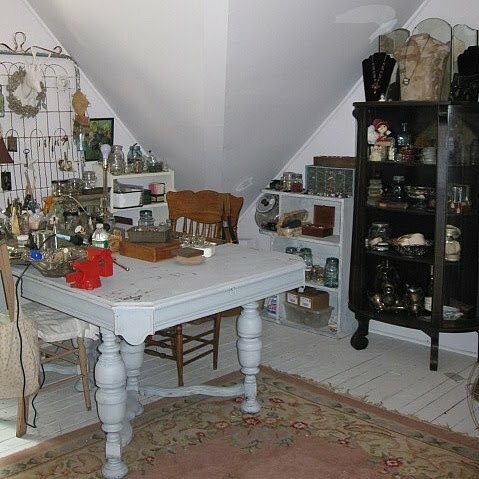 I really like how you have transformed the attic in to a beautiful studio. It truly is stunning looking room with a lot of attention to detail. Well done! I love your stuff!!! You did a wonderful job of transforming that orange into that lovely white. I have the same affliction...wonder if it is "out of sight, out of mind"? 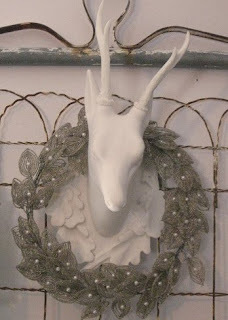 Its so pretty ~ it reminds me of My Nana's attic. Not that she had a studio up there. But there was a bunch of great "stuff" to look through, a big table and comfy chair. Truly your studio is a feast for the senses. Nana's attic didn't have heat though. You have a gorgeous studio space with so much character (I love the painted wood floors) I can see that you and I have the same affliction for not storing things out of sight. I like to store my things in old containers out in view...if I can see it, I'll use it. I'm posting my room tonight so I hope you'll stop by for a visit. OOOH I LOVE your new studio!!!!! I have to have all of my things out and around me in my studio in order for me to be creative so I can understand your space. It is so pretty and your things just add to that:) Have fun in it!!!!! Oh, it's just a gorgeous transformation. I love an attic hideaway! This is such a wonderful space! 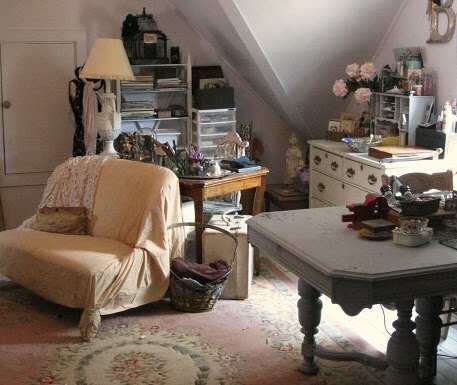 I love attic spaces and yours is so pretty...could definetely see myself spending lots of time here! I am the same way...love everything out where I can see it! Wow! What a beautiful creative space!!!! 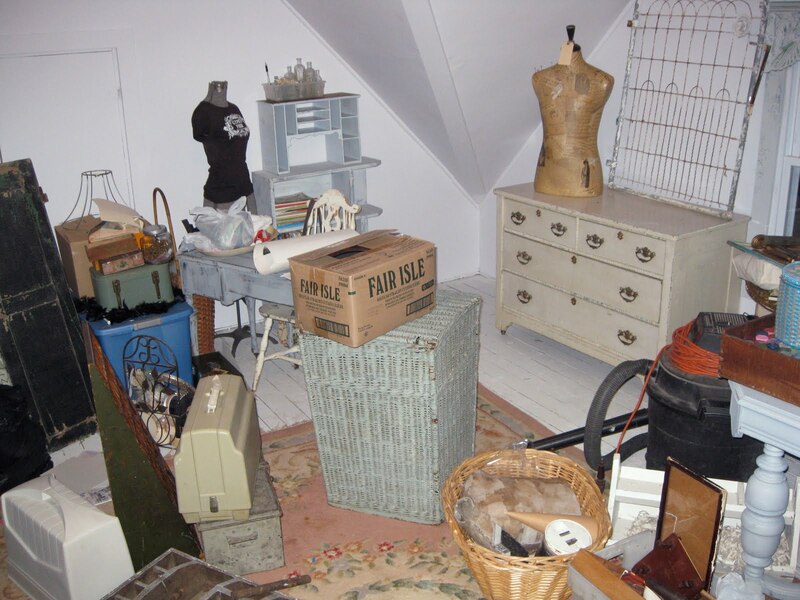 And in the attic!??!?! Yes, Mr. Fish should be given an award for getting the air/heat going! Nothing worse than cold piggies! I can certainly appreciate the joy of being able to leave out works in progress to keep the creative flow going. Your space looks so inviting to my muse!! Thanks so much for sharing your space with me, I enjoyed my visit!!! My name is Kristal and I love all of your goodies you make ~ you are a great inspiration. I feel embarrassed now show my little space...nothing as wonderful as yours ~ WOW!!! I would love to come hang out in your world ~ LOL!! Thanks so much for sharing! I promise I will be coming back more often. Very very pretty place. Love it! Very peaceful. What an awesome room to work in. It's like going back in time to a simpler time. Just love it. I love your beautiful work space, Beth! I like to have things out where I can see them, too, inspiration surrounds you! Wonderfully cozy and creative! Such a sweet cuddly space! Thanks so much for sharing! I really like your space. It looks very comfy. I would have a hard time leaving. This looks like wonderful place to create. I love the tied legs on the settee. I'm off to tie mine now. This looks to be a wonderful place to create. I love the tied feet on the settee. I'm off to tie mine now. What a transformation! Love the painted floor. So, enjoyed my visit with you. Enjoy the rest of the party. I love your new space! Such a wonderful place to create such wonderful things. I love love those necklaces with the little vintage doll heads and the keys! WOW! Your creative space is stunning! Gorgeous space, oh my you really made it look beautiful!!!! I love all the little cupboards and the gate! Wow, so much inspiration!!!! Your art is just stunning, I love it! Thanks for sharing your creative studio....I am in awe!!! Beautiful work space! I love the use of your garden fence or gate. If you take a look at my blog you'll see why. Wonderful job! You have a wonderful style, in your art work and your decorating. This is such a beautiful space. I'm adding your blog to my blogroll so I can pop over often! Wow Beth! Such an awesome space! 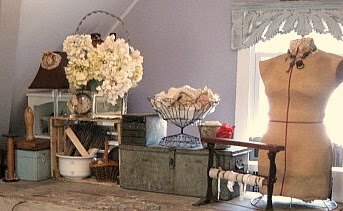 I love your attic studio! I love that you have your own space to create in. The ability to leave things out to work on...is awesome in itself! My studio is in my bedroom and although I really appreciate my space...it sure would be nice to not share it with Curly, Larry and Moe...(3 year old, 10 year old and Hubby)..smiles! Great studio! Beautiful! I love the soft vintage feel. Thanks for the tour and thanks for visiting my place. What a transformation. Unbelievable. Your space is wonderful and I love your creations. I'll be back after the party to look more at your blog. Can't wait! 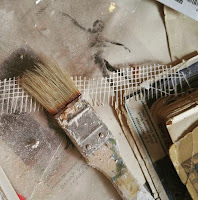 There's nothing more wonderful than a little attic studio - like an artist's garret! The transformation is stunning - white walls, so much light and full of your treasures. Your jewelry is wonderful. What a sweet retreat! You have so many goodies to create with and I'm really looking forward to the part about leaving a project in my new area and not having to clear the table for dinner. What a nice space and an amazing transformation! Isn't it great to have a place all your own to create in? Oh Beth it is lovely!!! I've never been able to achieve this look. I can't even describe it, but I know I love it . I've tried and it always looks like a tornado hit my house! I guess I will just have to settle for coming over for frequent visits. Thank you so much for sharing it with us! I hope you are enjoying the party! Your space is wonderful and so much fun stuff to inspire you!! Thank you for sharing. Your space is so pretty! I love the love seat and all the goodies on display. You're right - what I love about my space is that the project I leave, is the project I return to! Gorgeous!! I really like how you have made the attic into a wonderful studio, what a great place to have. Thanks for visiting my place. Wow that is some attic...super transformation for your creative space! Wonderful necklaces...I really can't say enough about them. TFS. 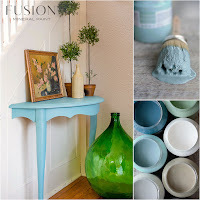 What a big difference a little paint and some pretty things can make! You trasformed that room from something dark and dreary to light and dreamy. Very, very pretty! Girl, it's no wonder that all your creations are so BEAUTIFUL...your surroundings are so inspiring!!!! 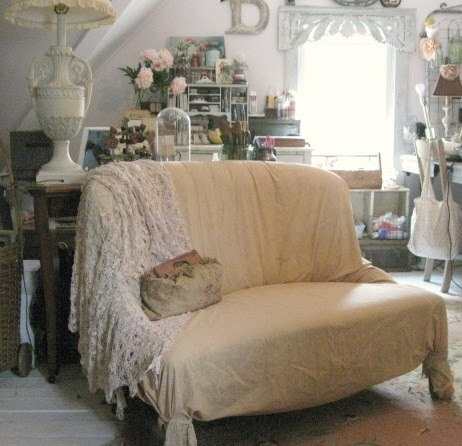 I just left Jill's (gypsy brocante) attic and geez, you two girls are the "attic queens" in my book! What a wonderful transformation Beth. 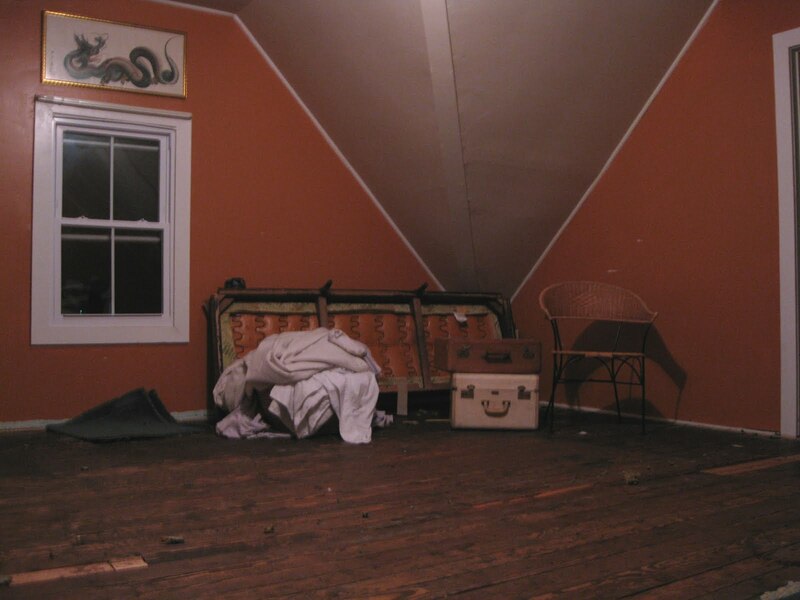 Your space has come a long way from it's burnt orange beginnings. I love the angled walls of the attic. And it's so bright now that you've painted the walls. I am always torn between having my supplies out of sight or out in the open. I find that I use things more when they are out where I can see them so your "affliction" as you called it is probably not such a bad idea. 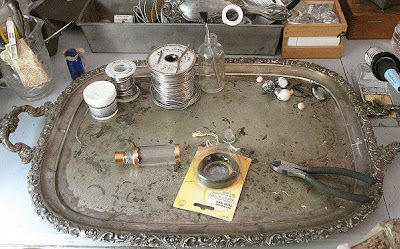 Love the silver tray with your soldering supplies - do you actually do your soldering right on it? Your space is beautiful and thanks so much for sharing it with us. You lucky girl! I love your attic space... So pretty! A true artistic haven away from the world...Great job on all of it! A girl needs her own space to put " THINGS" !!! WHat a truly unique and gorgeous studio space you have created! And those little china head/hat keys/necklaces are so stinkin' cute!!! Wow...talk about a transformation. It is lovely and peaceful and I love all your grown up stuff all around! It doesn't seem like clutter at all. 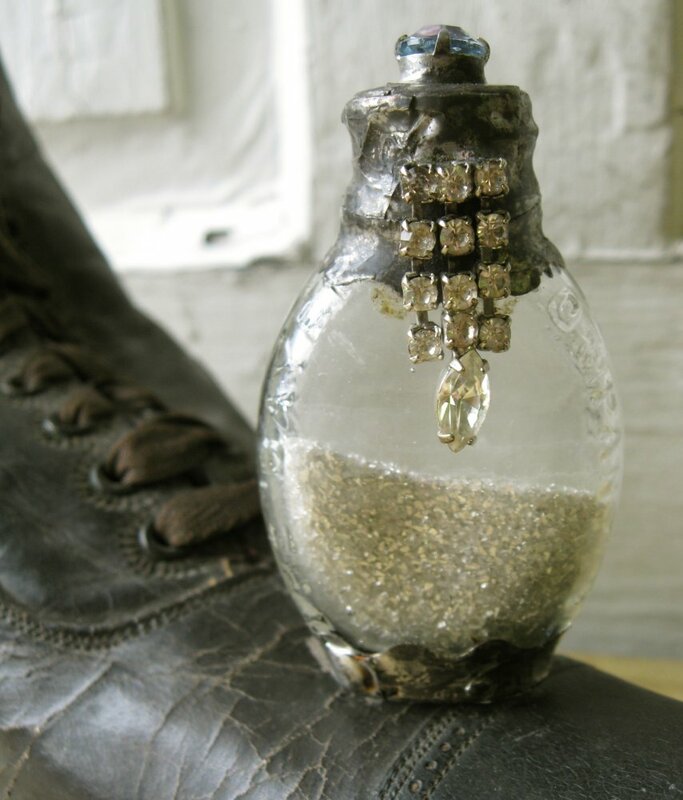 You jewelry is just enchanting. 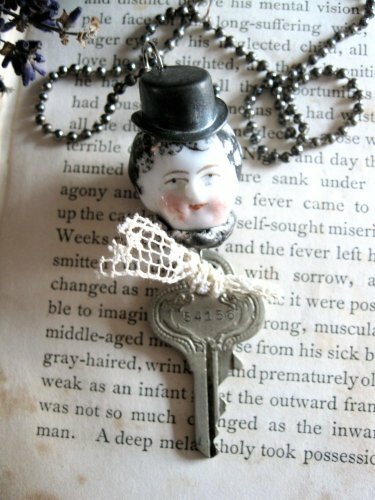 I love the Charlotte with the hat and key...very, very clever. You really have a unique way of putting things together. My daughter and I have a "young" blog and would love to have you visit, if you wish. 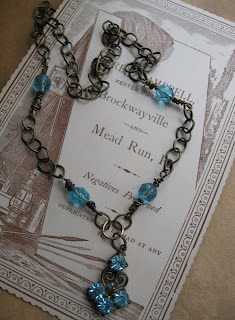 She and I have been making jewelry together for fifteen years but also have other interests. 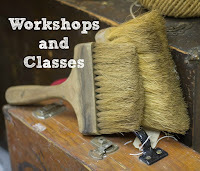 I love vintage paper crafts and she loves vintage fashion...and we both love estate sales! Thanks for giving us a peek at your creating site. 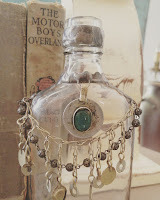 This is sure a fun party and is was fun to see your unique jewelry! Fabulous transformation-love your space! 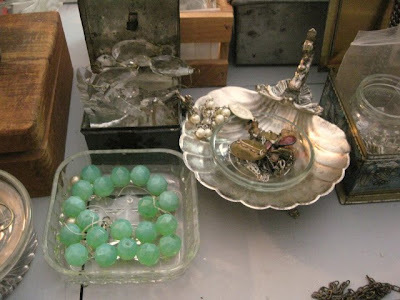 love all your vintage goodies. 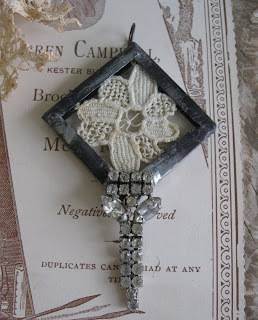 This is my first time stopping by your Blog and what a great find! Ooh how I love your creative space! Beautiful! I need a space like that so I can be so creatively inspired too! Wonderful space. 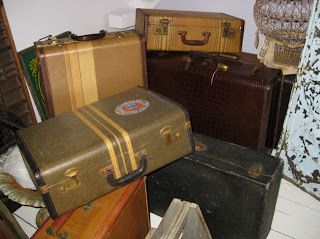 Love the old suitcases and the wire gate on the wall! SO beautiful! What a great space you have! I love your little slipcovered love seat with the lace throw-so creative! I love the painted wood floors and all the white. Love all of your white furniture and all your little doo dads. All your art is beautiful and I love your soldering tray. All I have is an old cookie sheet. 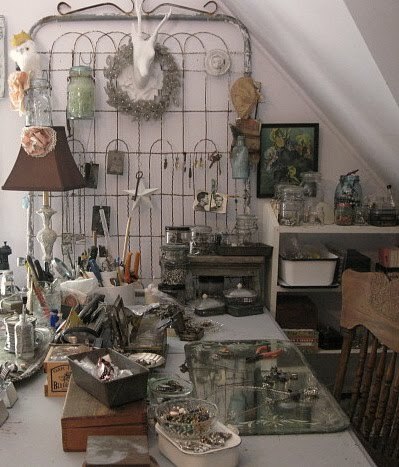 I just finished my attic studio this winter as well and I get what you mean about finally having a place you can leave your unfinished projects and not have to clean up every single time you are finished working then take it all back out the next time. It's always wonderful to see before and after photos and these are stunning. Your studio looks so warm and inviting, even if it was cold for part of the time. White walls are so clean and fresh, and I really like your big girl clutter. It really looks quite orderly and neat, considering all the projects you have going. 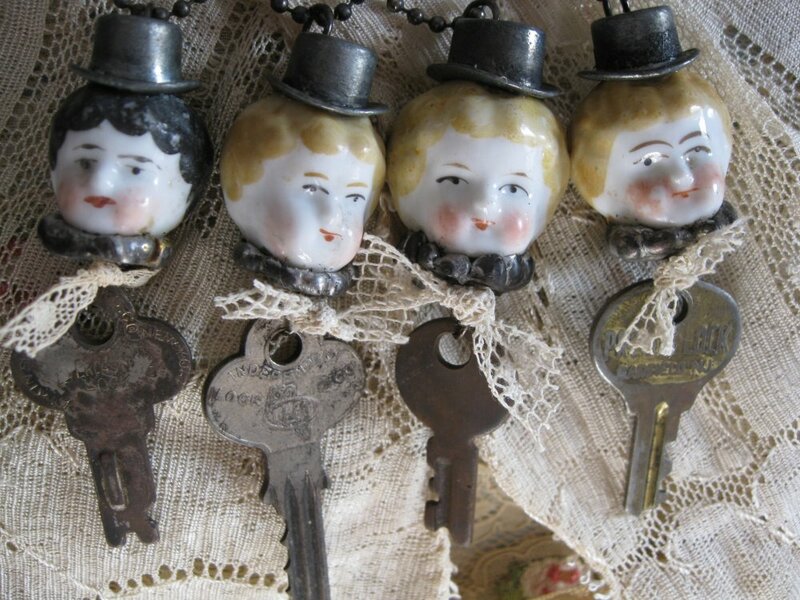 And those keys with doll heads are adorable. Thanks for sharing your transformation with us. Really georgeous! Thankyou for sharing! Hi Beth, WOW!!!! Your attic is amazing. What a beautiful space to create in. 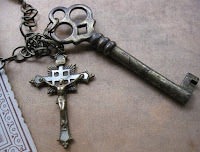 I love all your beautiful treasures and your work is gorgeous. Thanks so much for sharing with us. Geesh!!! I can't believe I am only at the "G's" on my little journey, I guess it is going to take me quite some time to make it through the list. So fun seeing everyone's space. Oh Beth ~ Your Creative Space is Amazing, I loved seeing the Burnt Orange beginnings ~ Love all the Vintage you have for work surfaces & Storage.... Love the Old Fence on the wall ~ Perfect! So pretty! The white paint really helped! Love your space and I like to keep some things out to look at too. 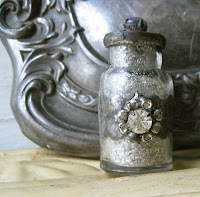 Some supplies are just so pretty it's a shame to hide them away in a storage container! Creamy and dreamy, just the way I like it! Love the before and after transformation. 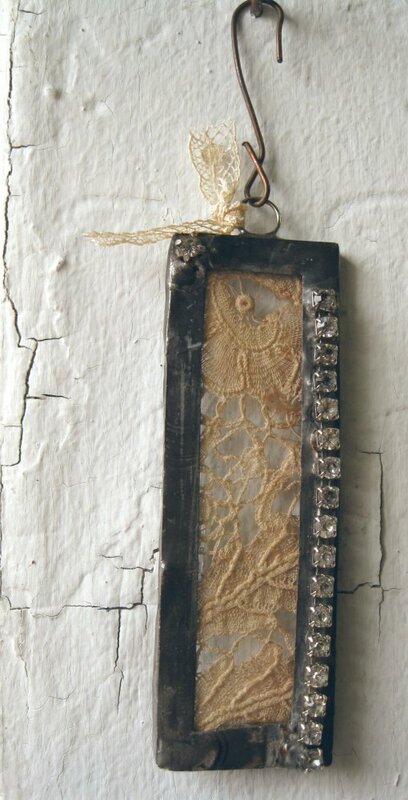 Your jewelry designs are stunning! Thank you for sharing. Sorry it took me so long to check out your creative space, but I'm in the midst of packing for my big move. Your space is so fabulous!! I would give anything to have a beautiful space like yours! You did an amazing job. 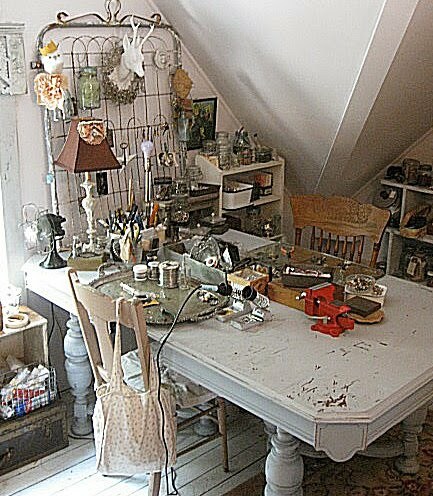 I love your attic studio! It's so shabby-Chic"y"==my style. I could just cozy up on that sofa and browse through some inspirational magazines or read a good book. And that white table is fantastic! I don't think I'd ever leave that room! Oh, my gosh... I love your blog! I just wanted you to know that I've chosen your blog to feature for the month of July! You have a permanent link up at the top of my sidebar all this month. i've finally had a minute to myself so i picked you and jill to come visit. i love how your studio turned out. the settee is gorgeous and so is your gate on the table. love it and love your soldering station! Your studio is wonderful! I could so curl up on that couch and spend lots of time. Thanks so much for the tour!! Fantastic space, love the brightness of teh whole space and the different shapes to the roof. Oh, you are such a lucky girl...your very own studio in the attic. I agree, leaving a project out, undisturbed, is the best feeling. I wish I could visit your space in person. I could stay for hours. You really made a great place to craft out of your attic. It is hard to make a space there actually because of the odd shape of the walls etc. but you seemed to not have a problem. You are truly a lucky girl to have such a fine place to be creative. looks fabulous and I love all your creations, very original.